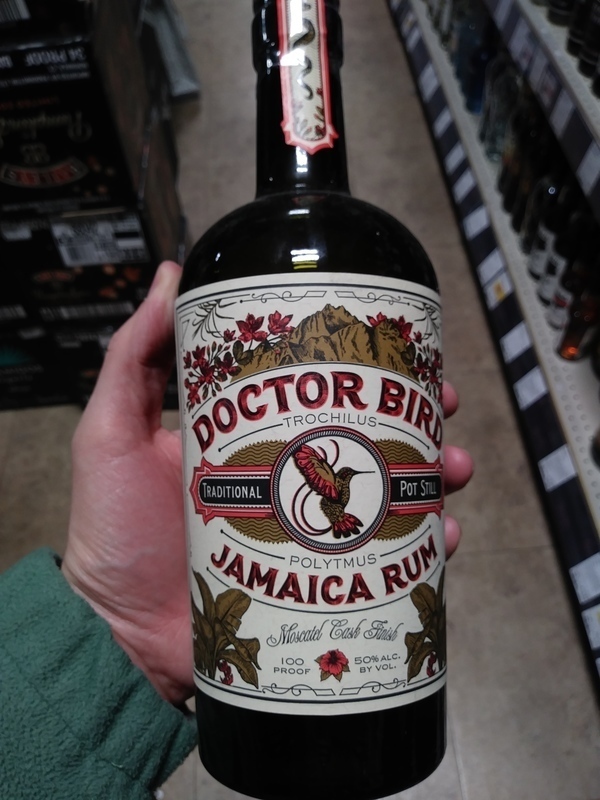 Have you found an online vendor selling Doctor Bird Pot Still? This is the first rum expression from Two James Spirits craft distillers, based in Detroit's Corktown neighborhood. A blend of Worthy Park pot still rums, blended and aged in St. Catherine Jamaica, then shipped to Detroit to be finished in Moscatel Sherry casks. It is bottled at 50% abv, making it a hit with tiki bartenders and afficionados alike. This is classic Jamaican funk with a distinct wood finish. The higher proof makes it an ideal tiki mixer. That said, pour it into a glass neat, let some of the alcohol evaporate, then add ice, and let the flavors come alive. Add a little lime, sugar and water and you've got yourself a quintessential and very tasty classic grog. Clearly Two James, despite focusing on their full lineup of other spirits (bourbon, whiskey, gin, vodka, absinthe, and mezcal), also have their ear on the rum appreciation scene (though, strangely, their rum isn't featured anywhere on their website). They're the only US (whiskey etc.) distiller I'm aware of the doesn't seem to be adding a rum to their menu simply as an add-on, because they have access to a still and some sugar, and because they're tried a few other things and wanted to design another label to slap on a bottle and sell to their friends (usually with disastrous results). The Jameses where to source good juice, and managed to take a risk (with the trendy but wholly unnecessary sweet wine cask finish) without ruining it. It's encouraging to see! So yes, the rum is good. It's got a big, funky nose that tickles your... nose. Lots of fruit, a good amount of wood. Some cherry, maple, hint of brandy. Though rather dry overall, it enters sweetly on the tongue, with a bit of a bite. It ends with moderately short finish on the throat, but the flavors do linger in the mouth for some time. The proof is just right—perfectly drinkable as-is, but a few drops of water don't kill it. Compare to Hamilton Jamaican Pot Still. It's eminently sippable for funk fans, but I love mixing with this, often using a 50-50 blend with Coruba in classic cocktail recipes calling simply for "dark jamaican" rum. It also makes a splendid Daiquiri, and I can only imagine the kind of funky Mai Tai you could get pairing it with something like La Favorite Couer de Ambre (for the record, I'm a Denizen guy, but I never turn down a Mai Tai using some respectable version of the "original" recipe). Haven't tried it yet, either, but I'll bet this would shine in a Planter's Punch. Again, I could have done without the wine cask finish (it's still a bit too young, and moscatel is dangerously sweet). It works well enough for cocktails, but the finish doesn't do the rum any favors when sipped neat. I'm just glad it didn't ruin it. I'm simply amazed that somehow, Two James managed to get so much right with their first rum release. It's funky, un-sugared, at-proof, competently aged, truly unique in the market, and reasonably priced to boot (their other offerings do appear to be pricier). As long as they continue in this pattern, I'll be coming back for more! Enjoyed a glass of Two James Doctor Bird Jamaican rum with my friend during a 5,000 mile road trip across 18 States. Bottle and label design look nice and unique. Golden color. Very strong and offputting glue and funk straight to your nose and palate. Nasty burn at the end. Can't even mix this one to hide the nasty taste. Not my cup of tea. Robustly full of flavor, and yes, funky as all get-go. But all in a good way. A fine, fine mixer to bring out some Jamaican spin. I drink it neat, as well. Not for everyone, but that's the whole point. Update: The more I drink this stuff, the more I like it. Try it in light cocktails, like a funky daiquiri, to bring out its flavors and let it shine. Again, it's not for everyone. Flavorful pot stilled rum with plenty o' funk. At 100 proof, its a little too strong for me to drink neat (despite loving the flavor), but it holds it own very well in a cocktail. This Detroit produced rum is made from several Jamaican rums. The label states it is distilled in St. Catherine, Which suggest it is distilled in the Monymusk or Worthy Park distilleries. It is pot stilled and aged in oak for six years before being shipped to Detroit and placed into Moscatel sherry cask. The color is very light. Thge nose is everything you would expect from a Jamaican pot still rum. It has that distinct funkiness of burnt plastic, banana, mango and spice. Its fragrant and refreshing. This is a 100 proof rum, and you can taste that initial alcohol burn that obscure some of the lovely flavors that reach you after the burn has passed. If you are not accustomed to the Jamaican funk you may be turn off a bit at first, but then keep reaching for the glass to renew the experience. A splash of water help to soften the initial burn, but not to much, less you drown out that unique flavor. Coconut, butterscotch, banana and FUNK! Potent, boisterous, and enjoyable! Not nearly as obnoxious as wray and nephew, but both rums share a strong pineapple/citrus aroma on the nose, though wray and nephew smells much more like chemicals than this. It is very funky, and for many it may be too much to have neat or even on the rocks. A tropical cocktail for this would be the best bet; I saw a recipe for a daiquiri using this and then plantation’s stiggins fancy (great rum). I really dont like wray and nephew and so this reminding me of it put me off a bit, but that’s personal. It is worth a try, and if nothing else the artwork on the bottle is attractive enough to add some character to your rum cabinet. Big Jam funk, big 50% ABV great price!! This is for the true rum lovers out there. It’s a gift at this price. As a lover of the Jamaican funk, I was pleased to discover this rum at Lost Lake in Chicago. Well balanced and integrated pungency, like over-ripe banana, keeps me craving... Didn't have the pleasure of trying it in a Maita'i or Jungle Bird, but something tells me it would be fantastic. I'll be looking to add it to my collection as soon as I can find a bottle. Fantastic. Lots of raisin and grape notes of course. Super funky worthy park distillate. Worth a buy. Maybe more than a few times. I didn't always like Jamaican rums, but as I've come to understand the process I've also come to appreciate the funky taste. I found this on a visit to Detroit. Two James is a local distillery there, who brought in barrels of rum from Jamaica, and bottled it in Detroit (basically using their distillery/bottling license to get around Michigan's outdated alcohol import laws). I poured it neat, and could smell the rum as soon as I started to pour. It has a strong aroma of over-ripe apricots with a slight tickle of the nose. The first sip has an interesting blend of sweet and tart with just a little burn on the back of the tongue. It leaves behind a fruity aftertaste like dried apricots and raisins. I added an ice cube, and it brought out even more of the fruitiness. This is a great sipper, especially if you enjoy the funk. Cheers! sad that Two James put their name to this rum. Tried it need and had a hard time getting it down. Used in a tiki drink some of the flavors came alive. A weak seven. I would say this rum needs to be used as a mixer. Only recommendable as a sipper if you truly love rum. It's very very funky but a little too harsh to sip. Still, the funk is delicious and would spice up any cocktail wonderfully. This one is just too funky for me. No way I can drink it neat. Trying it with ice now but it is still overpowering. If you like a super funky Jamaican rum this one is all for you. I will come back and raise my rating if I can find a nice way to enjoy this rum. Not very expensive, sub $30 for me in Chicago. This is the Laphroaig 10 year of Jamaican Rum if you know what I mean.